Jewellers place huge mark ups on their products, so you must buy diamonds from a wholesaler to get the best for your buck. Similarly jewellers will offer a low price when buying diamonds to insure themselves against any flaws that may be in the gem and therefore reduce the final selling price (which they may not have spotted for themselves). In general, avoid jewellers! Coloured diamonds are often worth more when sold, particularly yellows, pinks and blues. Unusual items can often be sold for a higher price, particularly if they are vintage. Common ring designs (clear solitaire rings, pear shaped diamonds, etc) are ten a penny, but buyers are more likely to pay more if they fall in love with a unique ring. 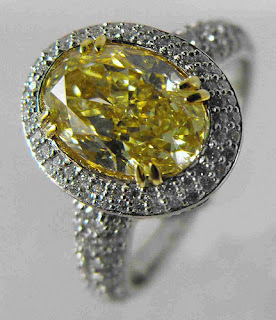 Coloured diamonds can also be found in different shades, making them more varied and special. Do look for valuable metals too: platinum is very strong and will last well if you want to keep your items for a while, and the price of gold has increased in previous years too. The quality of diamonds should be officially certified by an independent specialist to make sure you’re buying what you think you’re buying! The Gemological Institute of America is considered to be the best international authority on diamond quality, and any gem that you buy should come with a GIA certificate of quality. Safely storing and insuring your diamonds is essential once you have made a purchase, so look for a good insurer and safe deposit company. Storing diamonds at home is not a good idea, and banks can be unreliable (as we’ve found out in the last few years!). A private company is your best bet – look for one that specialises in storing precious metals and stones, so that if the company fails your diamonds are still yours. Great article with some very useful tips. I was so overwhelmed when I started looking for an engagement ring, I didn't know where to start. I found these guys on line, they have a video that helps explain how to buy a diamond engagement ring. The online tool is really fun to use and you can have a play at home before you go to a jeweler.